Based on search engine (Mainly Google) quarries also known as dorks a mass SQL-i attack is performing. The output is showing that more than 4,000 websites have been infected in this vulnerability. 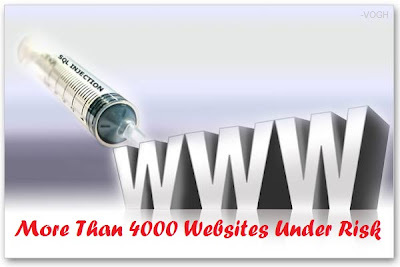 First when it was detected then the list of infected websites ware small, later it increases. As per report SANS more than thousands sites already been compromised in this attack. Typically it is inserted into several tables. From the information gathered so far it looks targeted at ASP, IIS and MSSQL backends, but that is just speculation. Impacted sites appear to be running Microsoft Internet Information Services (IIS) or Microsoft SQL web servers, and are using software from ASP.NET or ColdFusion. Visitors to hacked sites, which are vulnerable because they haven't fully patched their applications and the databases that support them, are being redirected to pages trying to push rogue anti-virus programs or another payload.